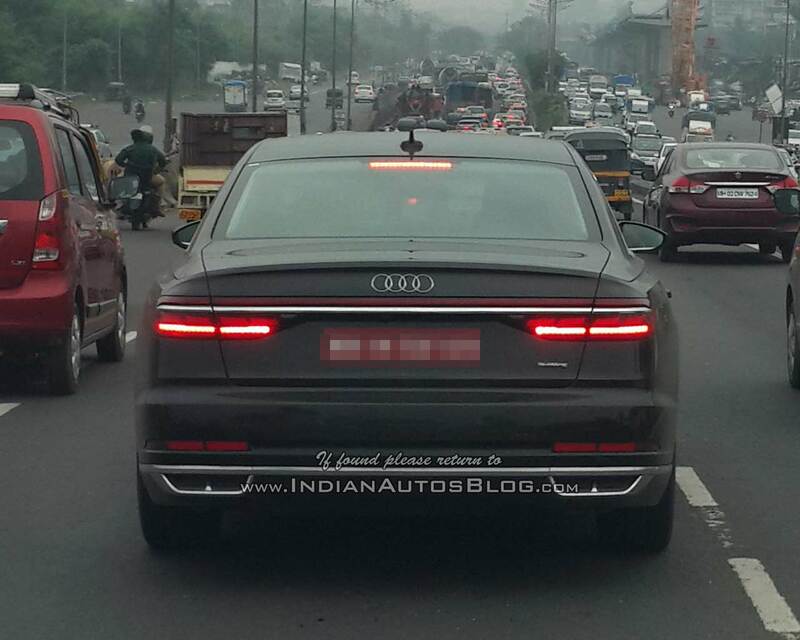 After China, Audi has begun testing the fifth-gen Audi A8 in India. Jubin Joshi from Pitstop Magazine has shared spy shots of the 2018 Audi A8 spotted in the country during local testing. Audi may launch the all-new Audi A8 in India exclusively in the long-wheelbase version. The 2018 Audi A8 is the fifth incarnation of the full-size German saloon. The new generation features an evolutionary design inspired by the Audi prologue concept. As before, Audi makes the A8 in standard-wheelbase and long-wheelbase versions. Only the latter is expected to make it our way. The all-new A8 L, at 5,302 mm long, 1,945 mm wide and 1,485 mm tall, is 37 mm longer, 4 mm narrower and 1,485 mm taller than its predecessor. The wheelbase has grown by 6 mm to 3,128 mm. New, more prominent Singleframe, HD Matrix LED headlights with Audi laser light, 21-inch wheels and OLED rear lights are some of the key exterior features. Inside, the Audi A8 has evolved not only aesthetically, but also technologically. 12.3-inch Audi virtual cockpit fully-digital instrument cluster, dual central display setup with 10.1-inch infotainment system screen and 8.6-inch screen for AC and comfort controls and B&O sound system featuring 19 loudspeakers, including a subwoofer and centre loudspeaker and a 16-channel amplifier with a total output of 755 watts are just a few main ones to name. The most notable aspect of the 2018 Audi A8 is its suite of autonomous driving technologies, which may not be offered in India. This is the world’s first mass production car to offer Level 3 autonomous driving. Level 3 is the first level in which the system monitors the driving environment. The all-new A8 can drive itself on highways at speeds up to 60 km/h. To avoid stressful driving in slow-moving traffic, the driver hand over the functions of acceleration from the start, steering and braking using Audi AI traffic jam pilot. There’s also the Audi AI remote parking pilot and the Audi AI remote garage pilot, for autonomously parking the car in and out of the garage. 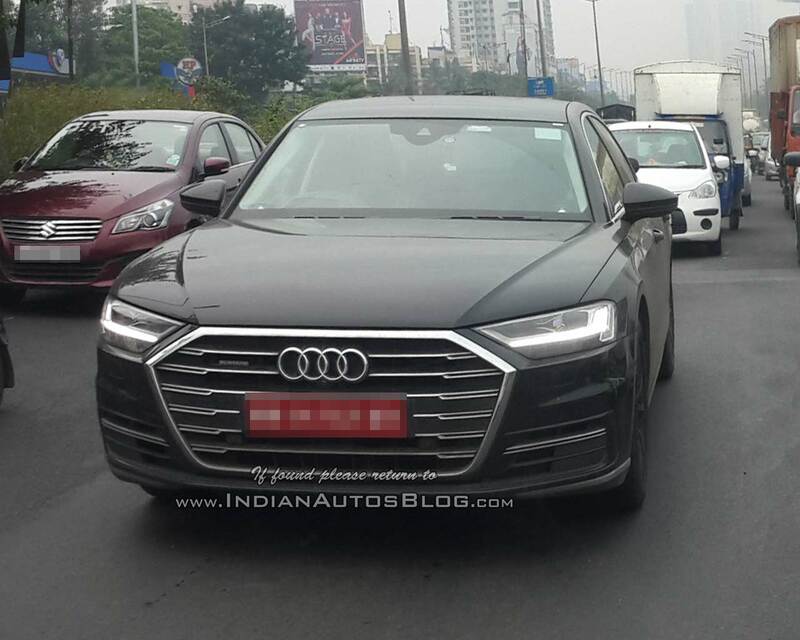 The Indian launch of the 2018 Audi A8 could take place in the first half of 2018. Audi will launch the 2018 Audi A8 internationally with two engine options: 340 PS 3.0-litre TFSI V6 petrol V6 and 286 PS 3.0-litre TDI V6 diesel. Both V6 engine models will have the 8-speed Tiptronic transmission and the Quattro permanent all-wheel drive. 460 PS 4.0-litre TFSI V8 petrol, 585 PS 6.0-litre W12 petrol and 435 PS 4.0-litre V8 TDI diesel options will follow. All engines will have mild-hybrid. Audi has confirmed plans for an A8 e-tron Quattro also. The plug-in hybrid variant will have a 3.0-litre TFSI petrol engine and an electric motor generating 449 PS and 700 Nm of torque together. Audi builds the fifth generation A8 at its Neckarsulm plant in Germany. Launch in the four-ringed brand’s home market will take place in November 2017. The Indian launch could take place in the first half of 2018.